Happy Valentine's Day (eve)! I'm so excited to be sharing two different recipes today that revolve around one of my favorite treats- S'Mores! I absolutely love the flavor combination of sweet and crunchy graham crackers, soft and gooey marshmallows, and decadent melted chocolate. Let's be real though- I've only gone camping a handful of times and I always end up burning the marshmallow or making a complete mess. Enter- the homemade, no-campfire-needed S'Mores. All those fantastic flavors we know and love, in an easy to make, delicious format! 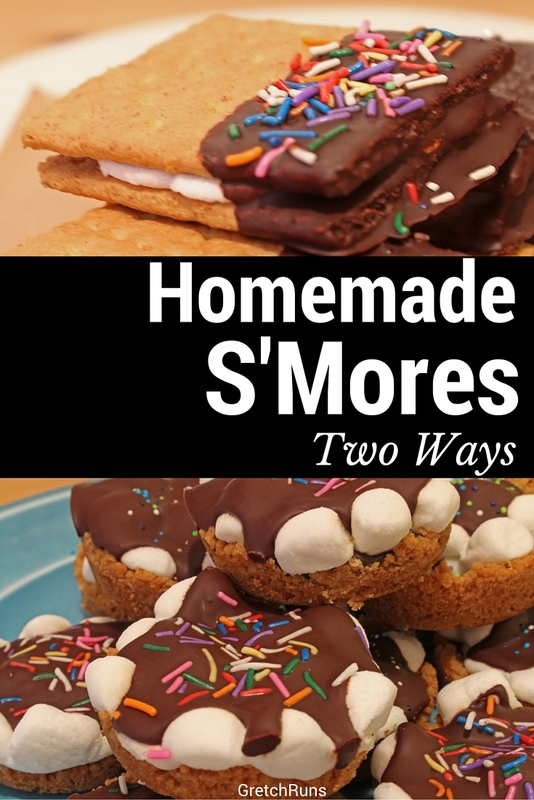 Today I'll be sharing two varieties of S'Mores treats that are perfect for Valentine's Day, whether or not you have someone special to share the day with! First up is a S'Mores cup, which comes together quickly and is perfect for sharing at work, with a date, with family, or your girlfriends for Galentine's Day. Second, we have Individual S'Mores Bars. I'll be sharing the recipe for one, but you can easily make a huge batch of these! I promise, both of these treats are perfect food for a Netflix marathon or a dessert for a romantic dinner. I hope you enjoy! I absolutely love making dessert cups. They're convenient for a party or having at home, because you can easily grab one and it's the perfect size for a little treat! These S'Mores cups come together in just a few minutes, and look adorable. I love how you can customize the decorations for different holidays, because I'm definitely going to be making these year round! Combine graham cracker crumbs, powdered sugar and 6 tablespoons melted butter in a bowl. Spoon one tablespoon of mixture into cupcake pan, and press to edges to form a cup. Bake five minutes, until edges begin to bubble. 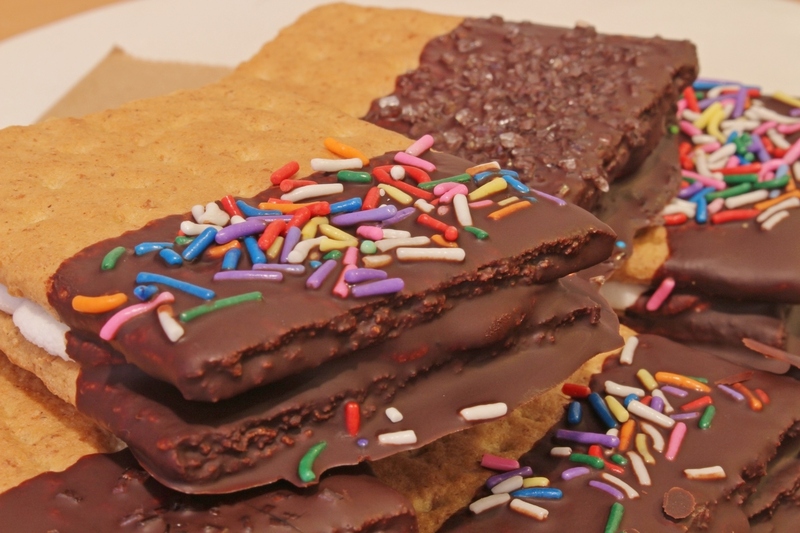 While the cups are baking, break candy bar into rectangles. Add one rectangle into each graham cup. Add mini marshmallows to each cup (I put in about 9) or half of a large marshmallow. Return to oven to cook for 1-2 minutes, until marshmallows are soft. Remove and cool. Microwave semi sweet chocolate and 1 tablespoon butter for about 1 minute until melted, adding 30 seconds if needed. Stir every 30 seconds and keep an eye on the chocolate! 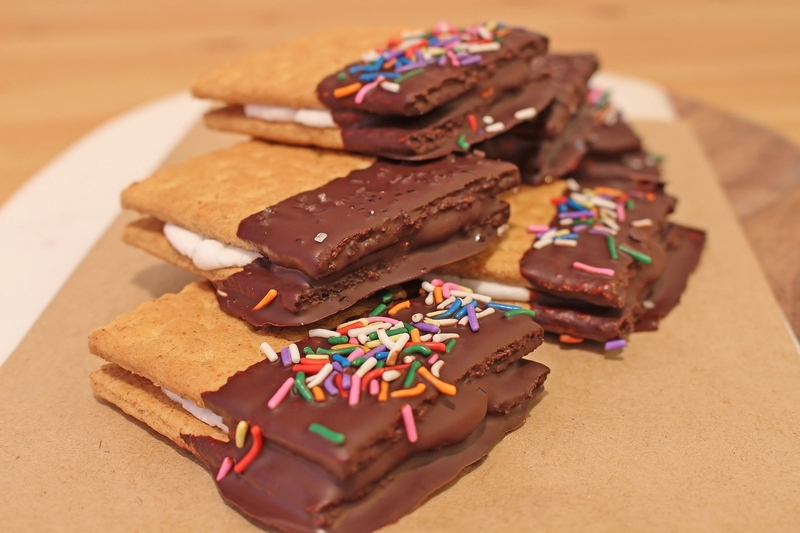 Drizzle chocolate over marshmallows, and decorate. Let dry for an hour, or until set. These little bars are so delicious and easy to make! You can easily make one, two, or twenty of these. They're definitely a lot closer to the traditional S'Mores that you eat while camping, so just close your eyes when you bite in and imagine yourself out in nature, enjoying the great outdoors (minus all the bugs and sleeping bag). Turn on broiler in oven. Top one half with marshmallows, and heat in oven for about 2 minutes until marshmallows are soft and starting to brown. Remove and immediately top with other half of graham cracker. Dip into melted chocolate, and add sprinkles or other decorations. Let dry on wax paper for an hour, or until set. Dan, you did a great job. I am doubly impressed with your self control skills seeing that there aren't any pieces with huge chomp marks in them. If I were in charge of taking photos? There would be platefuls of crumbs. HAPPY VALENTINE'S DAY! Have fun, you love birds! S'mores cups are the bomb! I've made them several times and they're always a huge hit! MMMM!! They're definitely a crowd pleaser! Mmmm these look so fantastic!! I like the first one ;) you saved me one, right? Ah these remind me of when i was younger and my siblings and I had no treats in the house so we would make ritz cracker-mini marshmallow- chocolate chip scores over the stove top-ha! The things we did for a little sweet treat back them! Strangely today I'm not much of a mores person anymore- but these look good! Love the cute little cups! That sounds good! I might have to try that out now! 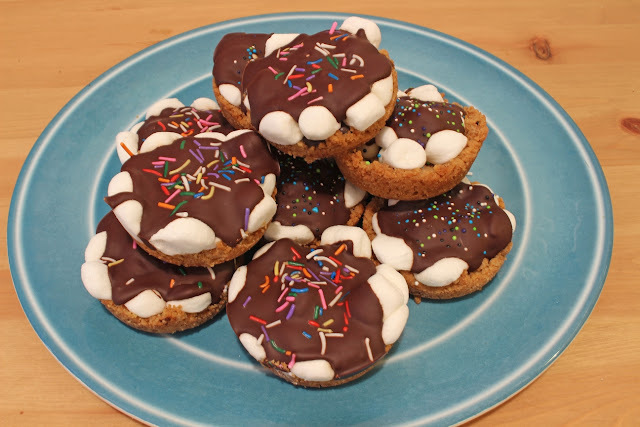 I love the idea of s'mores cups - they look way easier to eat than traditional s'mores, whose filling usually ends up smeared over half of my face. The colored sprinkles are a nice touch as well! They're so easy and practically mess-free! Just added you to my Bloglovin’ feed! Not sure why I never did that before, but now I’m happy to say I’ll be getting these delicious posts sent straight to me. And this recipe is exactly that- delicious. I’ve actually NEVER had a s’more, but when I do eventually try one, this is what I want to have. These look SO good and I've always loved s'mores! I went to an all girls summer camp from 5 years old to the middle of high school so I was the marshmallow roasting queen. I would slowly rotate them further away from the fire and get them perfectly golden brown and soft on the inside. You're making me want one of these now! Wow you have quite the technique for roasting! I just throw it in and hope for the best haha! Send me one!!! Yummy!!! I love smores. I keep a basket of the stuff for our firepit. It's been too cold to use it, but it should be warmer soon. i love both of these--fun new ways to mix it up! i'll have to try this with the littles! Oh my gosh, I love these so much. Adam is a huge s'mores fan - I need to make these! This is amazing, My husband and I are actually huge smores fans so this rings a bell with both of us. Thanks for sharing. 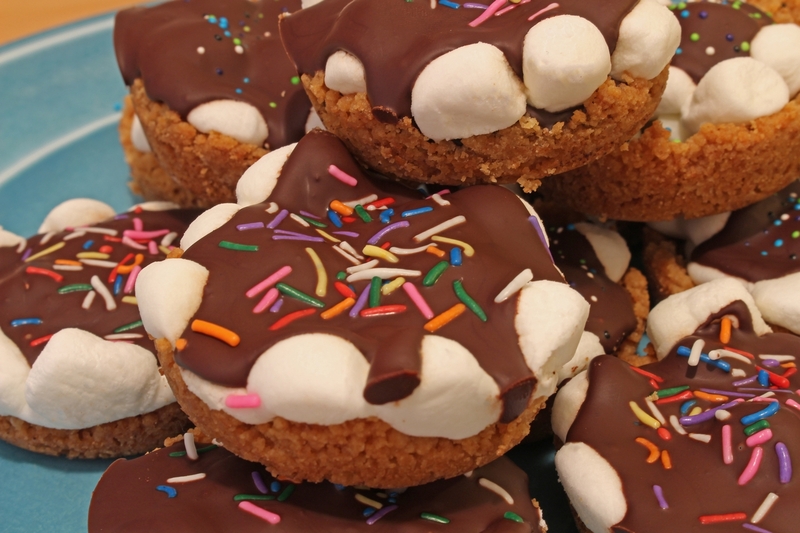 These look AMAZING , would love to try out the s'mores cups in particularl. Why not both at the same time! ?